No additional shader code is needed and debug display is handled on “program” level. Passes get automatically registered and UI refreshed. Very often when writing complex shader code (especially compute shaders) we would like to have some “printf” / debugging options. There are many tools for shader debugging that (I personally recommend excellent and open-source RenderDoc), but often launching external tools adds time overhead and it can be not possible to debug everything in case of complex compute shaders. We would like to have “printf” like functionality form the GPU. While no APIs provide it, we can use append buffers UAVs and simply hack it in shaders and later either display such values on screen or lock/read them on the CPU. This is not a new idea. I implemented very rough and basic functionality in the playground and made it work for both Pixel Shaders and Compute Shaders. It doesn’t require any regular code changes, just shader file change + checking option in UI to ON. 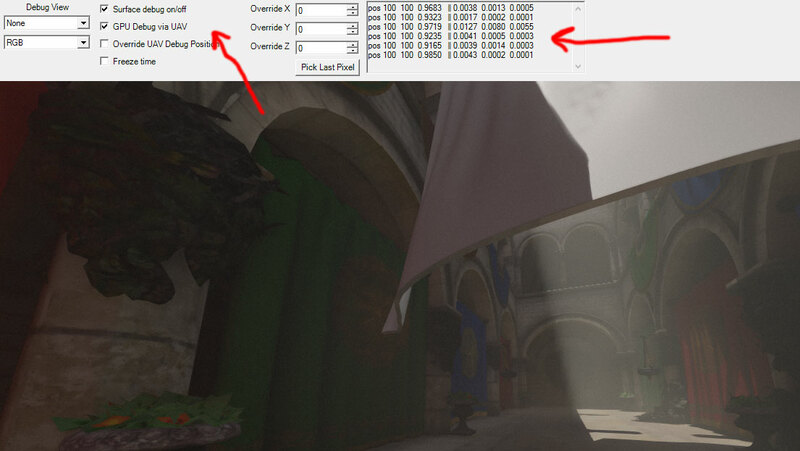 If you don’t want to specify / filter values manually in shader you don’t have to – you can override position filter in UI and use DEBUG_FILTER_CHECK_FORCE_VPOS and DEBUG_FILTER_CHECK_FORCE_TID macros instead. If you want to debug pixels you can even automatically set those filter values in UI from last viewport click position (hacked, returns coords only in full resolution, but can be useful when trying to track negative values / NaN sources). Added small dithering / noise to the final image – I quite like this subtle effect. Extracted global / program constant buffer – very minor, but could help reorganizing code in the future. Option to freeze the time – useful for debugging / comparison screenshots. This entry was posted in Code / Graphics and tagged .NET, C#, framework, github, graphics, graphics programming. Bookmark the permalink. Beautiful work, keep it up 🙂 Was there a main reason you chose SlimDX over SharpDX? For the SlimDX vs SharpDX I had some reasons when I evaluated both solutions – but it was quite long time ago, ~2years? Since then SharpDX evolved a lot and become quite good and mature – I believe that at the moment SharpDX makes much sense. When DX 11.2/12 will become available I will probably switch to it. 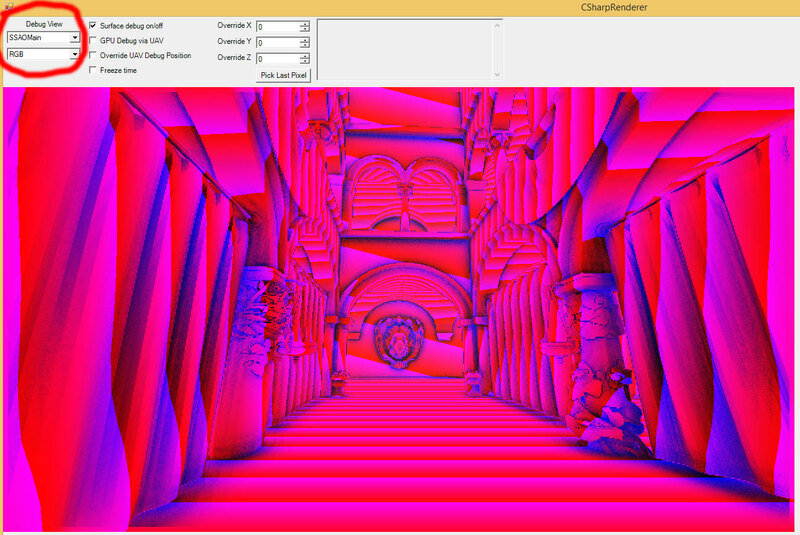 I hope you dont mind, I just ported what was on github to use sharpdx already. If you want to go in that direction at some point, you could use this as a start.